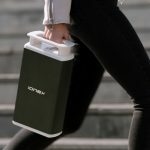 Kymco announced a new swappable battery system and electric charging architecture that will be used for ten electric scooters to be launched over the next three years. The first model, the Many EV, was presented along with Kymco’s Ionex electric scooter architecture at the 2018 Tokyo Motorcycle Show. 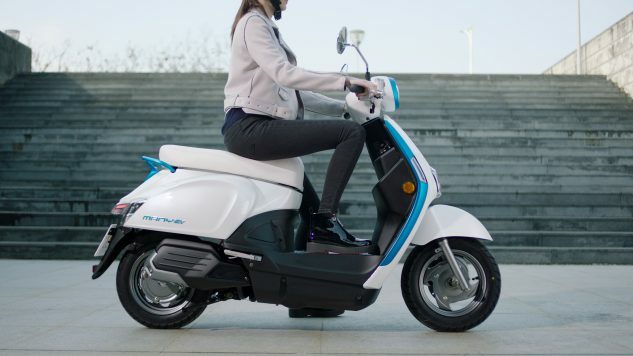 Kymco did not provide much detail about the Many EV’s specifications, but based on its name, we assume it will perform similarly to the Kymco Many 125 gas-powered scooter. 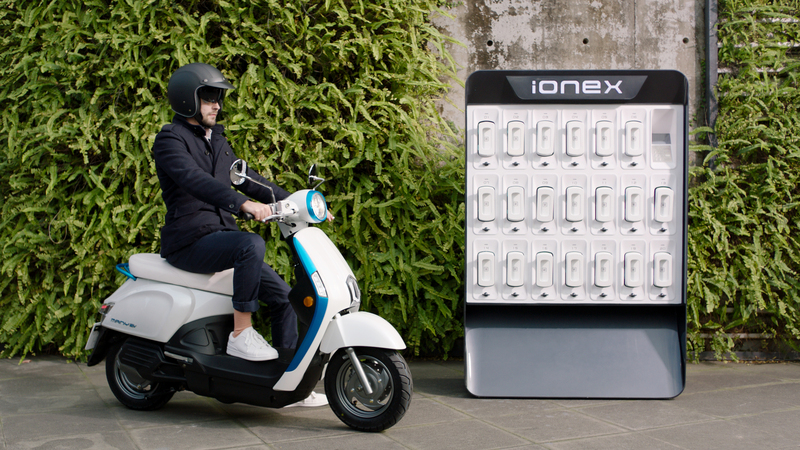 The Many EV looks nice enough, with a very Vespa-esque style, but it’s the Ionex platform that’s the big story here. 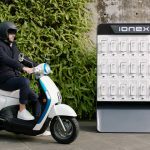 The Kymco Ionex platform aims to address four barriers to electric vehicle adoption: range anxiety, long charge times, a lack of public charging stations and sacrificing design to accommodate electric technology. 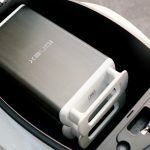 We’re not convinced Kymco has completely eliminated these four barriers, but the Ionex system does introduce some interesting ideas. 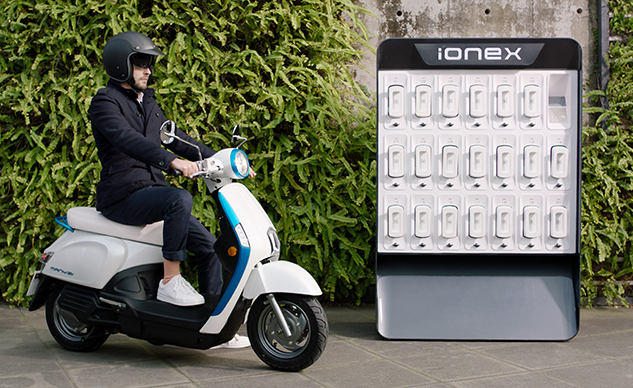 The key to the entire plan is how Kymco makes use of its swappable Ionex battery pack. 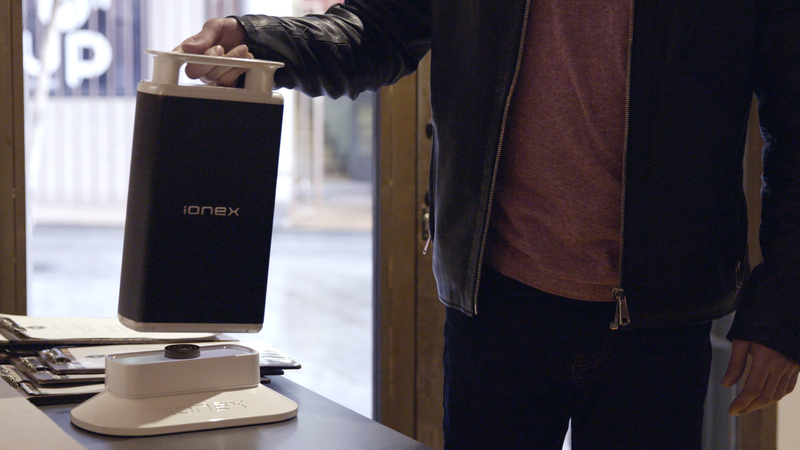 Swappable batteries aren’t a completely new idea. Some of Zero‘s models have removeable batteries, though Zero’s battery packs are much larger and more cumbersome than Kymco’s solution. 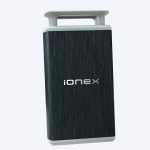 The Ionex batteries are more compact and easier to carry with grab handles and a claimed weight of about 11 pounds each. 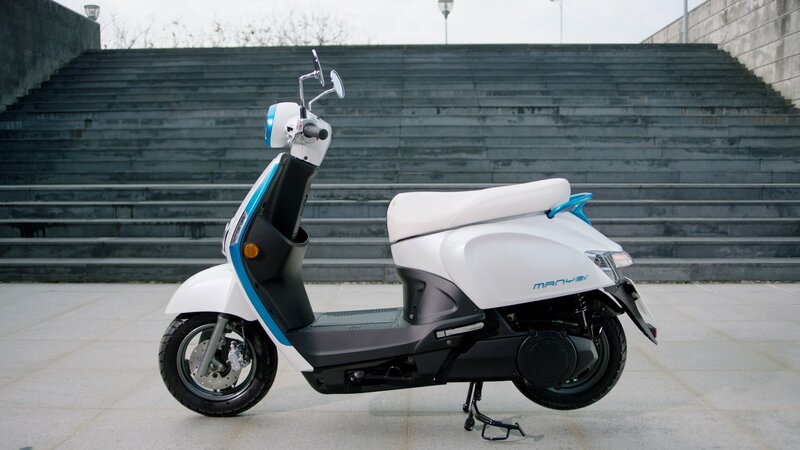 A closer comparison would be electric scooter maker Gogoro and more recently Honda announced a similar idea with its electric PCX. 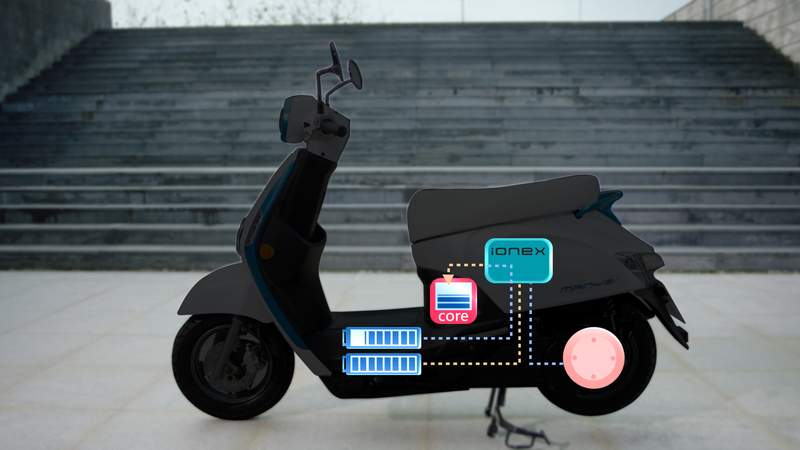 Kymco’s approach is to integrate the batteries into the floor of the scooter. 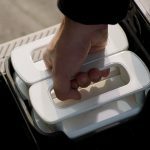 This not only keeps the weight low to the ground, it also frees up the underseat area to allow for a larger storage space. 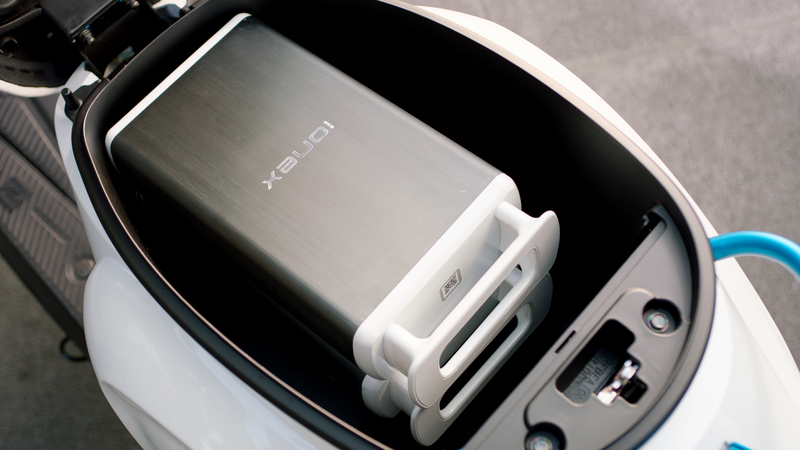 By contrast, Honda’s PCX Electric stores its batteries under the seat, leaving barely any room to hold other items. 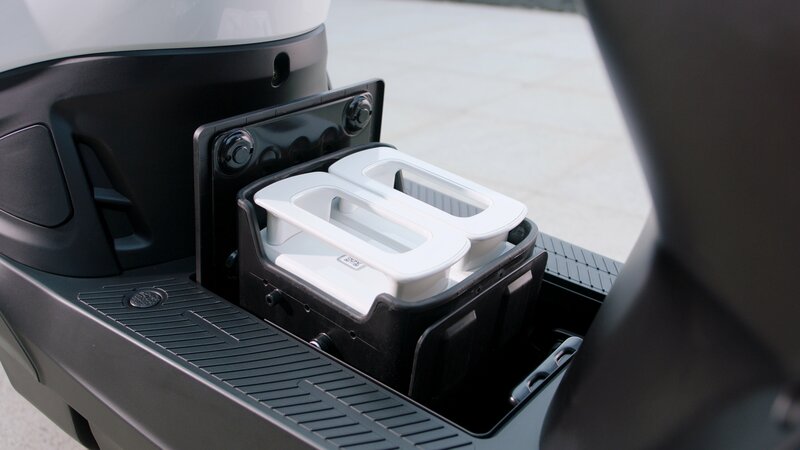 Kymco designed a rather elegant method of loading and unloading the batteries. 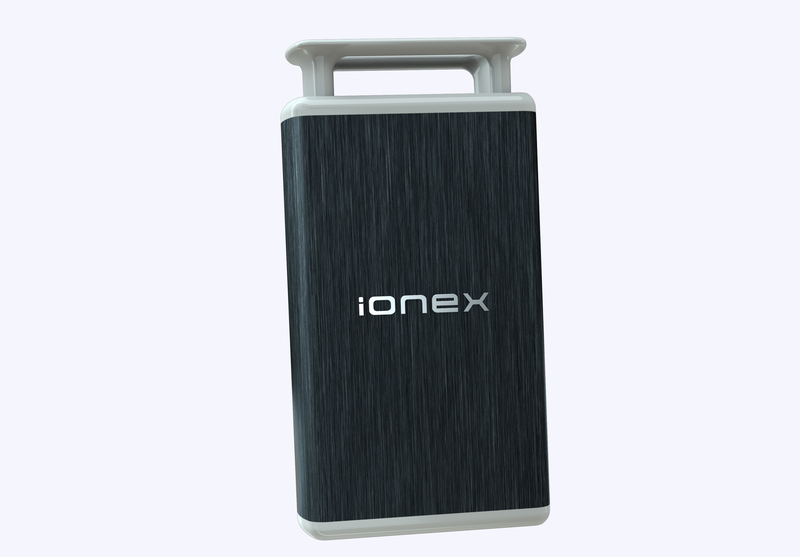 The rectangular battery packs are stored horizontally when in use. When the scooter is turned off, a switch on the right handlebar causes the batteries to rotate to a vertical position, disconnecting them from the scooter and making them easy to remove. Once removed, a nudge of the battery on a sensor next to the port reverts it back to a closed position. Another nudge opens it again when you’re ready to put in a fresh battery. 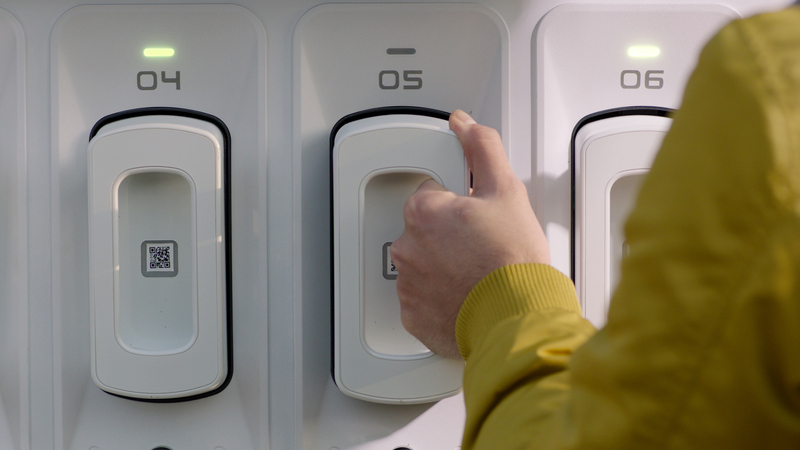 The Many EV holds up to two battery packs in the floor compartment, so you can charge them separately. 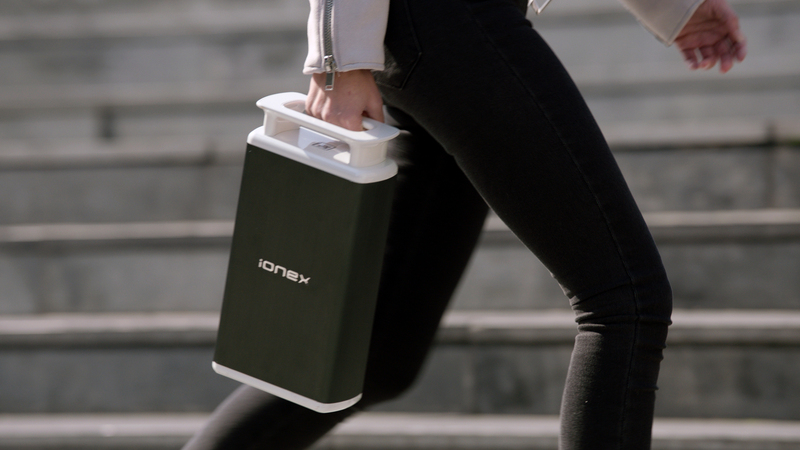 What’s interesting about the Ionex system is that it uses a third, non-removeable “core” battery under the front end of the undeseat storage area. 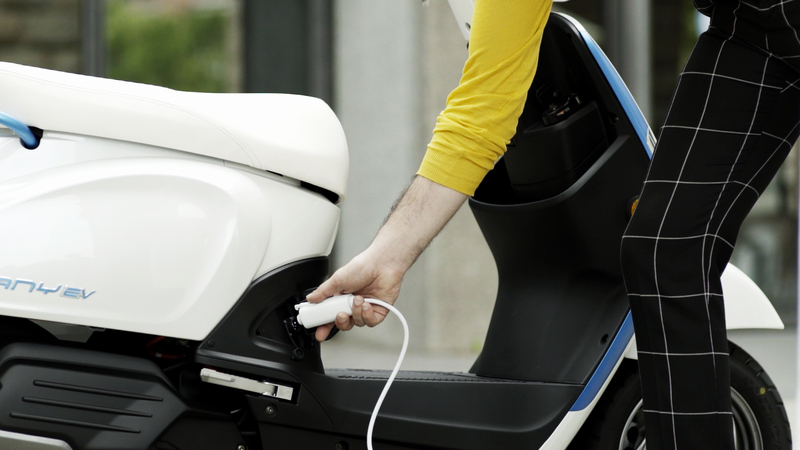 When the scooter is in use, the swappable batteries power the scooter while also charging the core battery. 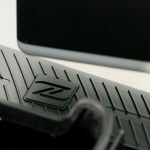 When the battery packs run low, or are removed, the core battery becomes the primary power source, allowing you to ride while the battery packs are being charged. 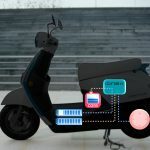 A power management system regulates how the removeable battery packs power the scooter or charge the internal battery. Kymco says the system switches seamless between power sources with no interruption to performance. 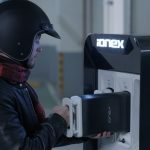 Kymco outlines several different ways to charge its Ionex scooters, making use of personal and shared charging options. 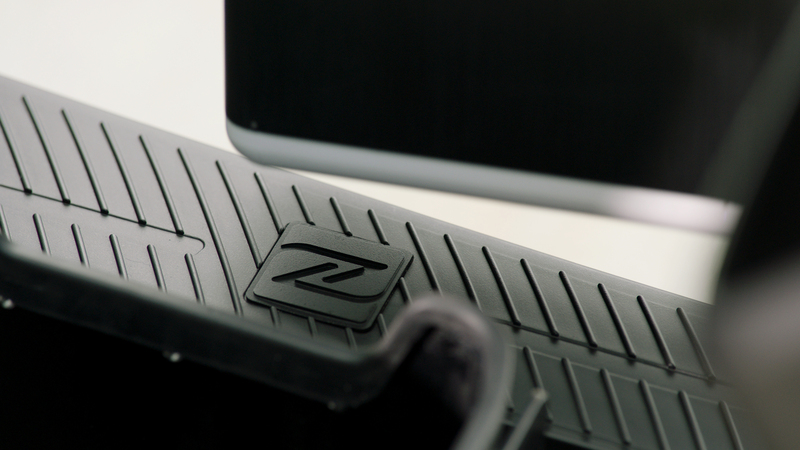 Owners can plug the scooter in to a compatible outlet or placing it on a portable charging dock. The shared charging options are where Kymco’s plan may be the weakest. 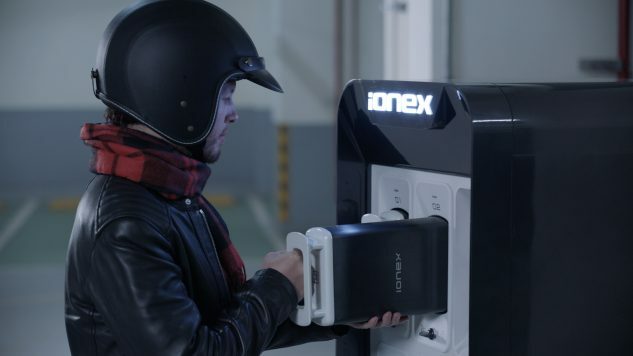 The Ionex platform includes a network of public charging docks, charge point networks and public charge outlets. 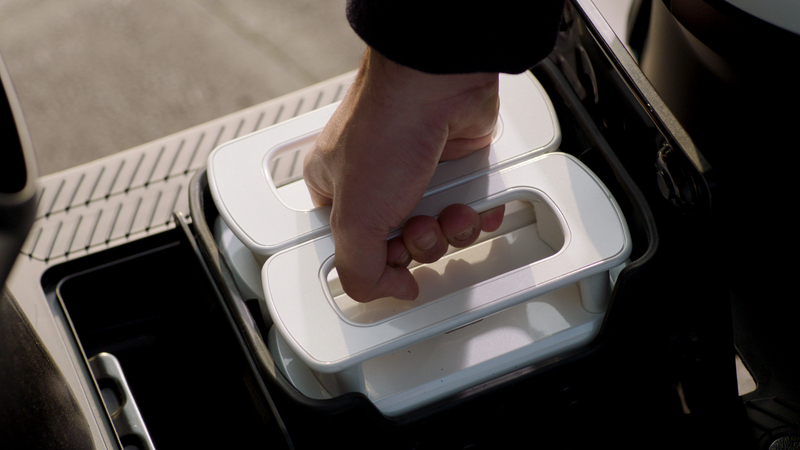 The charging docks, like the one pictured in the top image, can hold multiple shared batteries, allowing riders to swap a low battery for a fully-charged one. Kymco says these docks can be quickly rolled out to public places like transit stations and tourist areas. 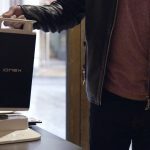 The potential snag is that Kymco wants local governments to help out, by allowing the installation of these docks on public property and by establishing policies to encourage the private sector to also install public charging docks. Kymco also proposes a network of businesses and offices to make charging outlets publicly available for riders to charge their scooters. Another option is network of Kymco charging locations where riders can leave their batteries to recharge. 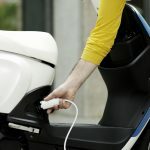 According to Kymco, these charging locations can return a battery with a full charge in less than an hour. Alternatively, these stations can also rent out batteries. 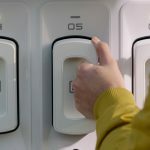 This also opens up the option of renting multiple batteries at the same time for longer trips. 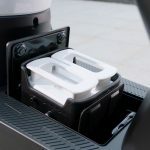 According to Kymco, the underseat storage area can hold up to three extra battery packs. 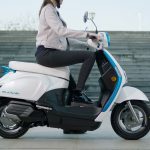 Combined with the two installed in the scooter and the internal battery, Kymco says the additional three batteries can extend the scooter’s range to up to 200 km (124 miles). 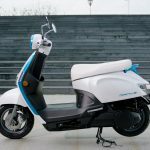 Kymco has set an ambitious goal of selling more than half a million electric scooters over the next three years, while establishing charging networks in 20 countries. Whether Kymco can get governments on board remains to be seen.